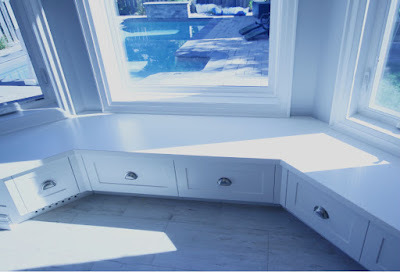 These custom built benches are a perfect addition for our client's kitchen eating area. The new cabinets are the same style and colour as their new kitchen cabinetry to have a consistent look and feel across the kitchen. The bench seating area has built-in slide drawers for additional storage for the kids toys or for other kitchen supplies. You can also see on this second picture that we reworked the HVAC vent to reroute the vent thru the series of holes and out thru the cabinetry... Hope you like it.